Everyday we watch recorded videos in YouTube and many other video sharing websites. 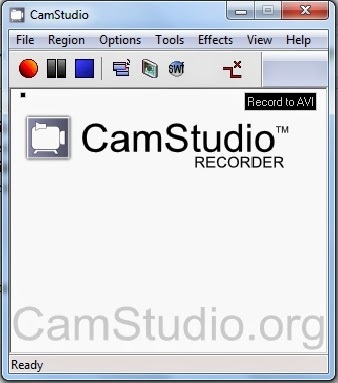 In this how-to guide I would like to share about a very basic open source application called CamStudio Free Screen Recorder to record your own video. You can also do experiments by recording your own desktop screen, some experts could generally choose TechSmith Camtasia Studio for recording their tutorials and how to guides, but that was quite expensive to buy. So in this article we will discuss how to record a computer screen with help of CamStudio free screen recorder. Step 1: Download the software from Sourceforge. Step 2: Install it like all other normal software by clicking a sequence of next buttons. Step 3: Open the application. Now you can see many menu options like File, Region, Options, Tools, Effects, View and Help along with 3 important buttons. Step 4: You can explore all the menu options and try in different ways of recording. Step 5: Click on the RED button to record the video, BLACK button to pause the video and BLUE button to stop the recording. Step 7: In the Region menu, you can find "Region, Fixed Region, Window and Full Screen" selection options. Choose any option you want before starting the recording process. Step 8: And one more important thing is audio settings. You can choose your microphone to record your voice. 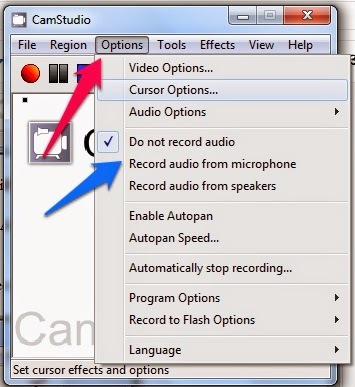 To activate this feature go to "Options" in the menu bar and click on " Record audio from microphone" option. Step 9: Now you finished your preparations to record Video and Audio. 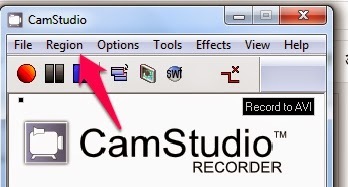 Now click on the "RED FILLED CIRCLE" Button under "File" menu to start the recording process and click on the Stop button to stop recording. Step 10: You are done! your video recorded and automatically saved in your videos folder in documents. Try to start your first experiment of recording your computer screen if you are a newbie. Please share it if you like it.